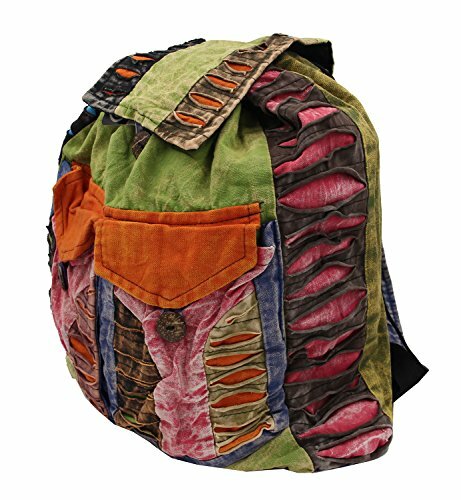 These handcrafted backpacks are each unique and will vary in color. The background color of the front and back of each bag will be stonewashed. Then contrasting complementary vibrant fabrics and stonewashed material is added using a razor cut technique to create a bohemian, funky look. The backpacks are fully lined and have front pockets with a button closure. Button for the front flap provides security for inside contents and there is also a drawstring closure with an adjustable clasp. Colorful and fun - will go with anything - sure to draw compliments. Handcrafted by artisans in Nepal . Recycled vibrant fabrics and stonewashed material is added using a razor cut technique to create a bohemian, funky look. If you have any questions about this product by Lungta Imports, contact us by completing and submitting the form below. If you are looking for a specif part number, please include it with your message.